There is a $200 Bank of America business checking account promotion available for both the Business Advantage and Business Fundamentals accounts. Plus, there is a targeted promotion being offered to LegalZoom Business Customers for up to $300 with a new business checking account and merchant services account from Bank of America. You can earn up to $300 via this special offer for opening a new business checking account and merchant services account. This LegalZoom promotion was targeted to a reader who was setting up an LLC on LegalZoom, but anybody may be able to qualify for this offer by having a Small Business Specialist from Bank of America contact you about setting up your accounts. 1. Open a new business checking account with qualifying deposits to earn a $100 bonus. 2. Get another $50 bonus when you pay 2 online bills. 3. Earn an additional $150 bonus when you also open a merchant services account to accept credit and debit card payments for your business. 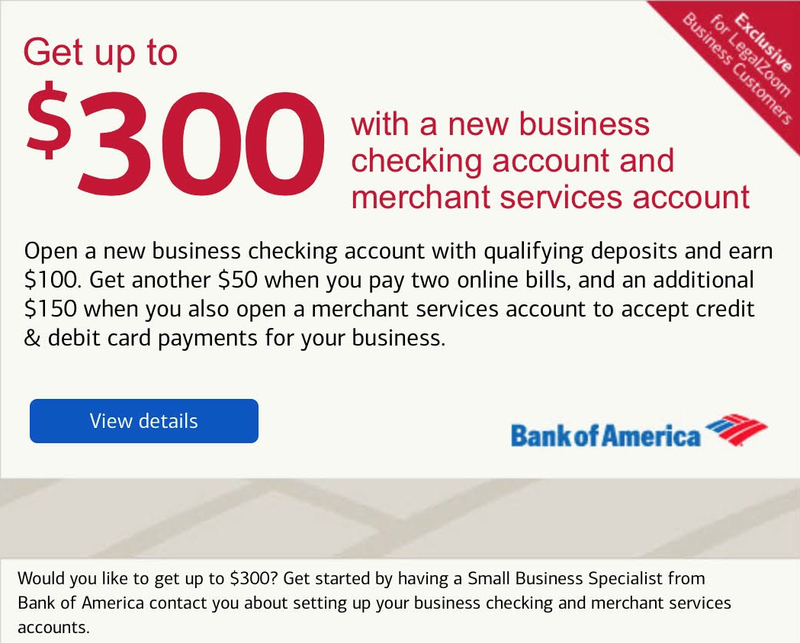 To qualify for this offer, you must have a Small Business Specialist from Bank of America contact you about setting up your business checking and merchant services accounts, so just visit the Bank of America website and submit your info to be contacted, and then mention the LegalZoom Business Customer promotion to see if you can qualify. You should also inquire with the Small Business Specialist to confirm the exact requirements of this promotion in regards to the qualifying deposit to earn the initial $100 bonus and any merchant services account requirements. You can get $200 when you open a Bank of America Business Advantage or Business Fundamentals checking account online by December 31, 2017, and make $1,000 in qualifying deposits within 60 days of new account opening. 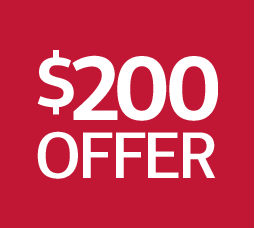 Check out this $200 BofA Business Promo Link to open your account online today. There is also an alternative $100 BofA Business Promo Link available with the same requirements, but then you only get $100 instead of $200. Qualifying deposits are net deposits of funds new to Bank of America and Merrill Lynch and does not include transfers between Bank of America and/or Merrill Lynch. The $200 will be deposited directly into your new Bank of America business checking account within 90 days of meeting the qualifications. You must be a new business checking customer. You are not eligible if you are an owner or signer on a Bank of America business checking account that is now open or that has been closed within the last 6 months. You are not eligible if you are a Bank of America associate. In addition to the above $100 bonus for opening a business checking account, new or existing Bank of America business card customers who open your first new Business Advantage or Business Fundamentals checking account can also earn 10,000 points, $100 cash back, or a $100 statement credit. To qualify for the bonus, you must apply and be approved for an eligible small business credit card account, link your new credit card account to the business checking account, and make at least $500 in net new purchases with your credit card that post to your account within 60 days from credit card account opening. Existing card accounts that open a new business checking account do not have a minimum purchase requirement to qualify for the card bonus reward, but you must link your card to the new business checking account. Cash rewards credit card accounts will receive $100 cash back. Non-rewards credit card accounts will receive a $100 statement credit. WorldPoints credit card accounts will receive 10,000 points (except for Business Preferred World MasterCard Charge Card Accounts, which already earn 10,000 bonus points upon first purchase). To link your business credit card account with your business checking account, you can call 1-888-287-4637. You can also apply for this Bank of America Business Card $100 Bonus Offer directly if you don’t need a business checking account. You’ll pay no monthly fee for Business Fundamentals for the first 2 months. Otherwise, pay $17 a month (fees may vary by location). You’ll pay no monthly fee for Business Advantage for the first 3 months. Be an active user of Bank of America Merchant Services, Payroll Services by Intuit, or the Remote Deposit Online Service. Otherwise, pay $29.95 a month (fees may vary by location). Take advantage of these Bank of America business checking bonuses for business card members. You may also be interested in these Bank of America Personal Checking Promotions for consumers. Get a $200 1-time bonus when you sign up for Business Fundamentals with Bank of America today.